lydia v. kolbe : surfing at waikiki, 1919. Volume 37 Number 1, February 1920. 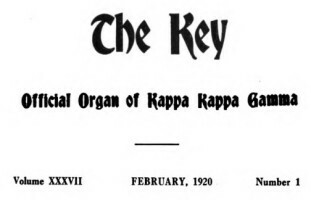 Kappa Kappa Gamma was a women's fraternity at Ithaca College. Our Grand President went to Honolulu with her husband, Dr. Parke R. Kolbe, when he was sent on a government educational mission. They stayed at "the beach at Waikiki." Wasn't that a shame? But read it yourself. Honolulu, T. H., December 1, 1919. Molokai looked more beautiful than words can express. For five hours we steamed between them and with the setting sun made our landing in Honolulu. Now after seven days we have no desire to retrace the 2,100 miles to San Francisco; no wish but to stay among these hospitable people; no pleasure but to spend the rest of our days in this beautiful country where one can live, eat, and sleep out of doors; where one can wear summer clothes the whole year round - Christmas would be awfully funny down here, wouldn't it? We live in one of the Moana Hotel cottages at Waikiki, the famous bathing beach. The mountains are at our back and the ocean in front and there are all sorts of tropical plants and trees growing in profusion everywhere. Even yet I feel as if I were living in a beautiful stage setting instead of among really, truly existing things. The trade winds blow constantly from the northso that although it is hot in the sun, one can always be comfortable in the shade. We go into the ocean every day, sometimes twice, and although I can not use a surf-board correctly I think it is the best sport I ever tried. The best amateur swimmers in the world are here now for a swimming meet and we are often in the water at the time Norman Ross and Duke Kahanamoku have chosen as their swimming hours. Geoff Cater (2017) : Lydia V. Kolbe : Surfing at Waikiki, 1919.